HOME >> COMMUNITY >> OTHER SCIENCE FICTION SERIES >> SO JOSS WHEDON TRIED TO SAVE BATMAN, SUPERMAN, WONDER WOMAN AND KINDA FAILS? 'JUSTICE LEAGUE' WAS A BOX OFFICE FLOP? So Joss Whedon tried to save Batman, Superman, Wonder Woman and kinda fails? 'Justice League' was a box office flop? The Warner Bros DC cinematic Universe or DC extended movie universe featuring Batman, Wonder Woman, Superman and all those other characters has kinda failed. The History of the Cola Wars or Marvel vs DC? at one time Warner Bros was the only game in town with the comicbook super hero world, they had the campy Adam West and Wonder Woman tv show, the Saturday morning cartoons Justice League, they had Richard Donner and Christoper Reeves, the Tim Burton movies, the Nolan films with Neeson, Heath Ledger, and finishing on the Dark Knight Rises with Christian Bale, Tom Hardy, Anne Hathaway . Along come other studios making a comeback as Warner Bros celebrated rolling around in their money made at the box office blockbusters, the James Bond movies are revamped over the years, Star Wars comes back and Fox buy the rights to Marvels Xmen when Marvel was almost bust, when they went backrupt in the 90s they sold off characters like Professor X, Wolverine, Storm, Cyclops etc. Marvel themselves launched their own studio the past 10 yrs and the movie with Ironman is a huge hit...nine years ago at the end credits in the Iron Man movie (2008) they put an after credits scene Tony Stark with Nick Fury...it sent shockwaves and a buzz around the comic-con culture, buzz around the world across the internet and the cinema box office game has never been the same since, and Disney recently bought Marvel making the company even bigger than before, t-shirts, video games, mugs, broadway, theme park rides you name it. The one regret I have here is not fully investing.....like being some smart business guy, not buying enough in Marvel, I mean with a few thousand you could buy into them, eat up those shares and watch their product skyrocket? DC Warner Bros Justice League, the petition to get a “director’s cut” of a Synder-only version of the film has now reached over 100k signatures. Oh yeah and depending on how you count the numbers up? Justice League Production may have cost as much as 350 million to make the movie!! an insane figure! I mean who the heck spends that much money? it sounds like it may have been its destiny to flop. Justice League could lose Warner Bros millions according to projection at websites like box office mojo etc The JUSTICE LEAGUE movie is set to lose as much as $100 million, a big loss reported following the Warner Bros DC film’s box office flop. Now things might turn around yet....some movies start bad but have great legs or 'staying power' going the distance...others seem to be able to make money back overseas like say Europe, Canada, S.Korea, China, Australia etc but everything so far might point another bad bomb, a box office turkey...all signs point to a flop? The Aquaman star Jason Momoa hit back after bad reviews and poor box office for Justice League. The recent report on movies in Forbes breaking down what the actual costs of the film are likely to have been including an estimated $150 marketing budget, suggests that, after much number crunching, the movie might end up facing a loss of $50-$100 million for Warner Bros.
DC superhero team up is going to make a whopping loss...easily defeated by the Third movie in the Thor film franchise. ... is just agreeing saying I tried but failed? is he playing around? even trolling? or should he have been allowed do more reshoots? Shirley they were trying to lose money. Why else cast bafflack? Justice League is finally here and there is A LOT to dig into with this film. As a fan of these comic book movie genre films, I know that there’s a lot riding on this movie. This isn’t simply a matter of being entertained. Because it is my belief that the success/failure of this movie will potentially alter the direction of the future movies we’ll be getting from WB/DC. There is without question going to be a lot of debate over this film. It will be incredibly divisive. I’m fully anticipating the same or similar reactions and fall out from Batman V Superman to happen here with Justice League. Is Justice League Yet Another DC Flop? Which upcoming DCEU films will die if "Justice League" continues to flop? Given budget and box office calculations, along with marketing costs, Cinemascores, overseas takes, likely multipliers, and other confusing factors, Digital Trends assessed which films on WB/DC's ambitious upcoming slate are most likely to suffer if Justice League continues to underperform (as it almost certainly will). Reviewers have not been impressed with “Justice League,” which carries a 40% rating on Rotten Tomatoes. Its opening comes two weeks after Disney-Marvel’s “Thor: Ragnarok” debuted above forecasts with a $122.7 million opening weekend in what was the fourth-biggest launch of the year. So it's safe to say Justice League = flop? the playstation xbox looking villain? I actually liked Daredevil the movie. I know... I might be the only person who did. My brother says I'm an idiot. I dunno. I've never seen him as Batman, so I'll reserve judgement for now. I'll just say everybody was in an uproar when Mr. Mom was cast to play Batman in 1989 and to this day I still think that Keaton's Batman was the best of all of them. I'd be curious to see what happens when Joss has complete creative control of a DC franchise from start to finish, rather than trying to clean up Zach Snyder's depressing and dark mess. Marvel is still killing it. Even though I'm bored of Super Heroes now, at least you aren't depressed watching a Marvel flick. I think Ben Afflek could probably be a decent Batman if he had good direction. He'd at least be as good as Val Kilmer, and he'd have to be better than Clooney. Ben Affleck probably is right around the level of Val Kilmer as Batman. That's of course not a good thing. He just doesn't have the commanding presence that Batman needs. He's just sorta an everyday guy talking. The lines he has to say aren't even written in the way humans speak so it really just doesn't work. That's not all his fault of course. The movie was just plain bad. The action scenes were just bad CGI explosion fests where nothing felt significant. I mean would anyone care if any of the heroes other than Wonder Woman died? Not me because the other heroes aren't likable. Even the over the top awkward Flash just feels ridiculous. Old school WWF wrestler Aquaman was comically bad. "My man!" "I dig it!" And there giving him a stand alone movie? yikes. They need better characters and fast. The Marvel movies work because they start with the characters and then build a story around them. So, even if the plot falls a bit flat the characters are fun and you care about seeing them succeed. They also keep the tone light hearted so if there's some stuff that wouldn't happen in the real world it isn't too jarring. 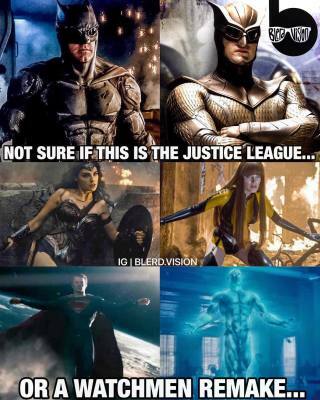 The DC movies seem to start with a concept like "what does it feel like to be an alien on earth?" and then they just sorta throw some action around that and then have Superman make "I think I pooped myself face" a lot. That's not a recipe for a good movie. I think Justice League was trying to explore the concept of leadership and selflessness. I get the impression Joss came in and was like "omg this isn't even a movie I have to find a way to make this entertaining to an audience" and it ended up doing neither well. I guess I didn't follow. So Zack Snyder directed, and then when finished, Jose was sent invto make the film better? Is that how it was? As director or as writer? Zack Snyder directed but had a death in the family before reshoots were finished. He tried to power through but eventually said he just couldn't do it and they brought in Joss to finish up. Rumor has it Joss decided to do extensive reshoots and edit out a lot of scenes. I wonder if reshoots involved more Gal Gadot and less bafflac - that must certainly be improvement. The reason it's not doing well is because it's a story that's been told many times before, a group of hero's get together to fight a foe, there's an epic battle and some witty one liners. The next Justice League will have the same story with a different villain. Joss did the best with what they dumped into his lap. I think that's why I've soured on Super Hero movies in general, and why the Marvel movies aren't doing anything for me either. It's kind of just like watching the same movie over and over again with a different wrapper. At least with the Netflix shows, there is a lot more character development and they seem to have more going for them, although I didn't like or even finish Luke Cage and I have yet to see Iron Fist. I didn't hate the movie. Yes, I saw it, despite ... everything. For me, what rang most true about why the movie was so bad was the villain. That, and the all powerful boxes. Poor CGI and no real motivation for Earth to be involved... it just seemed like weak tea. And too damn similar to Avengers and the upcoming Infinity War. I think they overdid somethings, like the physics of some powers... there's no consistency. If this person can pick up a house, why can't they ... what ever. Flash, I liked, but for a few minor issues. He's the young goofy equivalent to Spider-Man. The scene w/ him and Wonder Woman , OK, I liked that. But the FX , the electrical charge he gives off , right before he speeds... seems like a awful obvious and needless tell. Just have him go. And good grief, tripping seems to be his big nemesis. He's unstoppable until he trips and falls. What's that all about ?